Inspiration Sr. Sec. School, a seat of learning is much cherished dream of a great pioneer a devoted and leading educationist Shri N. C. Balutia. His ideas have taken the shape of reality through ever- zealous enthusiasm and untiring efforts of an efficient and diligent team dedicated to the cause of child education. Inspiration Public School started in July 1999 and was inaugurated by honorable former Chief Minister of Uttarakhand Shri Narayan Datt Tiwari. 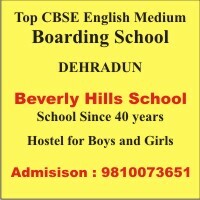 The educational institution is an English medium co-educational day school under the management of Inspiration Public School society registered under the 1860.